Abra (Julie Harris) and Cal (James Dean) commune in the 1955 film of East of Eden. The two East of Eden films are the sort you more or less like depending on how well you love the novel. If you're devoted to the book, the best and most famous of the video productions may disappoint you as it picks up only a small part of the novel and changes it radically. The other, lengthier treatment will please book-lovers but risks exhausting those who aren't familiar with the whole sweep of Steinbeck's long novel. The 1955 East of Eden is of course famous for the mesmerizing method acting of James Dean as Cal Trask in his first movie role. Which ticked off the actor playing his father, Raymond Massey, an old-school thespian who felt Dean was self-indulgent and difficult, purposely setting about to rile him—which Dean was. But it worked well for the film, director Elia Kazan recognized, making the scripted misunderstanding of father and son all the more palpable. The trouble for a devotee of the book is that this relationship, especially focused upon from Cal's tortured point of view, comes to overpower everything else. This movie is based on only part of the novel, which covered two complete generations. It picks up the narrative about two-thirds of the way through, starting with Cal as an older teenager tracking his middle-aged, brothel-running mother. The stories about how his mother got to that stage in life, about her relationship with his father up to his birth, after which she went missing, and about his father's own tumultuous early life are never told, scarcely hinted at. No wonder Massey seems a grouch. He's given nothing in the film to show how he got to be what he is, what he had gone through. The rationale behind his strictness with Cal, his favouring of son Aron (Richard Davalos also in his film debut) and his estrangement form his wife, according to this movie, seems to be just that he's an old-fashioned, Bible-reading stick-in-the-mud. He just doesn't get modern young people like Dean—I mean Cal—and prefers straight arrows like Aron, old before their time. Also missing from the film is Sam Hamilton, the book's folksy inventive dreamer who became Adam Trask's friend and helped humanize him. An even worse deletion from the film is the character of Lee, the Trask family servant who is educated and wise beyond appearances. It is Lee in the novel who comes up with the key to understanding good and evil, and who helps bring about the concluding reconciliation of father and son. In the movie, part of this role falls to Aron's girlfriend Abra, played winningly by Julie Harris. 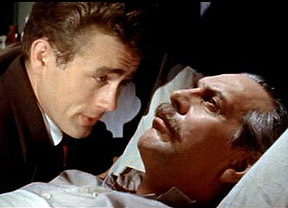 John Steinbeck apparently appreciated Kazan's adaptation of his novel as well as Dean's powerful performance, accepting that a film does not belong to the book's author. And we can agree, East of Eden is a great film in its own right—a modern classic. Wonderful scenes are forever etched in film history. But for a book lover who wants to relive the experience of the novel on screen, well, you have another option. With its own pitfalls.